Pat Moore and Waterville Valley Present….. 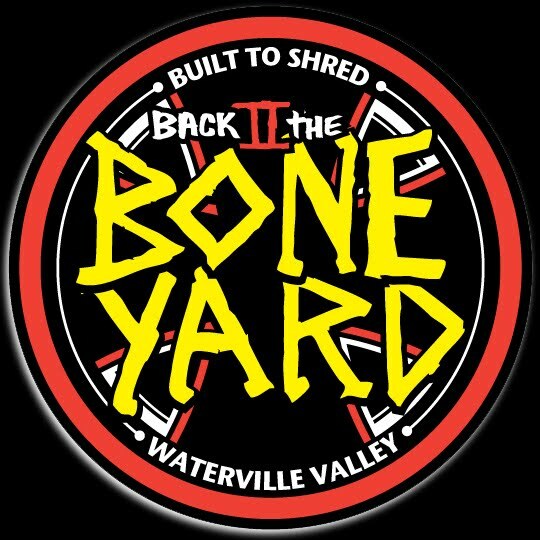 Call in sick to work, play hooky from school, leave food out for Thunderpuss, and be at Waterville Valley on Tuesday, March 23rd for the 2nd Annual Back to the Boneyard! Last year was a wicked good time and there is no doubt that the second installment will be even better. It’s a celebration of snowboarding, old and new for all with a hunger for shredding or a thirst for lurking. There will be a BBQ, raffle, mini ramp skating, PBR après party and Red Bull after-after party, with the like of Pat Bridges, Bill Enos, Ben Newton and Pat Moore. Multiple features and events will be built to shred in a new contest format. The Pat Bridges cigarette race, the Bill Enos Giant Slalom are just two of the new events planned for the event. Prizes will be awarded to each rider category from event sponsors Volcom, Special Blend, Foursquare, Forum, Eastern Boarder, Electric and Red Bull. Also new for this year’s event riders could be crowned the King of the Boneyard for exceptional riding on each feature. All proceeds from the event will be donated to the Pat Moore Foundation, helping kids reach their goals in snowboarding through the Waterville Valley Snowboard Team. So bring your spring gloves… or your powder mitts because its New Hampshire and no one can really predict what will happen. Registration for the event will be $20 per rider and run 8-10am at the Event Yurt with all proceeds going to the Pat Moore Foundation. Call 888-236-3699 to book it!